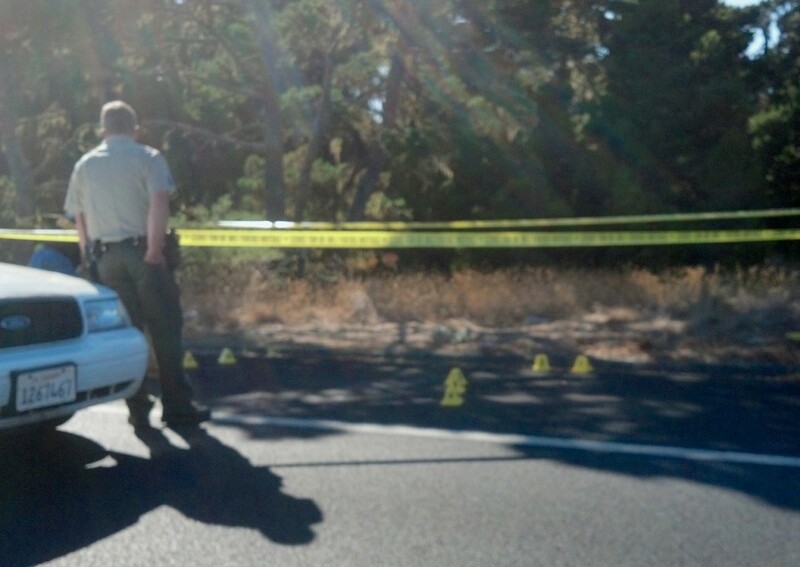 MANILA – On Sunday September 8, 2013 at about 12:32 p.m., the Humboldt County Sheriff’s Office Dispatch Center received a 911 call of a possible injured man lying on the southbound shoulder of State Route 255 and New Navy Base Road, Eureka (approximately 100 yards north of this intersection). While deputies were responding, a second person called the Sheriff’s Office to report the injured male appeared to have been shot twice with an arrow and there were two people fleeing the area on bicycles, possibly suspects or involved with this incident. One witness attempted to detain these individuals, at which point the suspects abandoned their bicycles and fled into a heavily wooded area on the west side of the road. Deputies arrived in the area around 12:39 p.m. and located a 41-year-old male victim who had suffered three injuries that would later be determined to be from a crossbow. The victim had a grazing scalp wound, an arrow to the hip and an injury on his shin from a glancing arrow injury. The victim was transported to an area hospital where he was treated and released for his injuries. Deputies then located a second victim, found deceased, approximately 200 yards west and into the wooded area from where the first victim was located. This 44-year-old male suffered a single arrow to the face (names of the victims being withheld at this point). An extensive manhunt was undertaken in the heavily wooded and coastal area for the two suspects. Assisting was a helicopter from the California Highway Patrol, Wardens from the California Department of Fish and Wildlife, Officers from the Arcata Police Department along with a K9 from that agency, Deputies from the Humboldt County Sheriff’s Office and Sheriff’s Office Special Services including ATV’s for searching the beach, and Rangers from the Bureau of Land Management. The search was called off at approximately 11:45 p.m.
Detectives from the Humboldt County Sheriff’s Office have been assigned to this investigation. The motive for this incident appears to be the belief of the suspects that the victims may have stolen items from their transient camp. The victims are homeless and have been occupying an encampment for the last several months. It appears the suspects are newly arrived to the area and had a crude encampment, which a search warrant was sought for and served on. Phoenix Triton King, white male, 09-12-1992, short blond hair, blue eyes and black heavy framed glasses, 5’7” and 140 pounds (believed to be from Lake County, California). Female, black or dark skin, 16 years of age, shoulder length “frizzy” hair that is most often worn in a bun, black hair, brown eyes, 5’0”, 120 pounds. The Humboldt County Sheriff’s Office is seeking the arrest of both individuals for Murder and Attempted Murder. These individuals are to be considered dangerous and potentially armed. Anyone who believes they have seen these individuals are encouraged to not approach and telephone 911 with information. Detective Jen Turner has been assigned as the lead investigator on this incident. Anyone that might have further information on this case is asked to call her at 707-268-3642. Unfortunately, photographs of the suspects are not available at this time. This entry was posted on Monday, September 9th, 2013 at 9:35 am	and is filed under News. You can follow any responses to this entry through the RSS 2.0 feed.